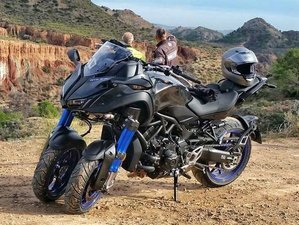 Join this tour and you can participate on the weekly tests of many Yamaha motorcycle models on the sunny Costa Blanca. The tour is open without breaks from October to May and you can come at any time during this period. You will have six days with a guide, 12 routes to choose from, and always return to the same hotel. Every day, you can change the tested motorcycle, which is encouraged. A perfect organization of a holiday and friendly atmosphere as well as roads that you will not forget. You accommodation is at Hotel Cases de sant Jaume in Benissa. You will have a choice of double or twin rooms and four people apartments. Single rooms are available for extra charge. It is a climatic hotel with great views out of the windows. There is a swimming pool, bar, restaurant, free Wi-Fi, and air conditioning. You start from Moraira and head through Cumbre del Sol to the highest point in a region one can go on a bike. Then go down using very curvy roads to the sleepy bay to see Cala Moraig cave. Next, you ride to Cap de la Nao cape and admire stunning views. Then, head to Cap de Sant Antoni cliff via seaside resorts and volcanic beaches. Next, you go for a coffee break in Les Arentes, where you can relax by the sea. Curvy roads lovers will meet a foretaste of what they can anticipate in the next few days. After a short break, you head to the Pego area where you can find rice fields. Then, using roads which will warm tires and your hearts, you go to Calp and end your trip in Moraira passing a beautiful orthodox church. Time: Starts at 10 a.m. and end at about 4 p.m.
You start from Moraira and head straight to Valencia. Time: Starts at 9 a.m.
You start from Moraira and head north-west. Passing Benissa, you turn south to a very curvy road where you can admire amazing views on Sierra de Bernia mountains. The road leads through picturesque towns where time stopped 50 years ago. Next, you head to a small, mystic restaurant in the high mountains, where you can dine like kings. Then, you go on the Col de Rates pass where you face hundreds of corners and at the end, stop for a coffee break. Next, go south passing a waterfall, then to Calp, and back to Moraira. Time: Starts at 10 a.m.
You start from Moraira and head to Benissa. Passing Sierra del Ferrer on the left, you reach Parcent. Going further west using largely untraveled roads, you pass Sierra de Carrascal with its highest peak of Cocoll. Then turning south, you reach Castell de Castells town where you turn west to Gorga. Then, head to famous Castell de Guadalest; a big tourist attraction. There, you explore castle (entrance costs: 4 EUR) and museums. Then, you head south-west to Benidorm, known as the Spanish Las Vegas. Next, using the seaside boulevard, you will be passing Alta and Calp on your way back to Moraira. You start from Moraira and head south. Passing Calp alongside Guadalest river, you reach Sierra Aitana mountain range and further to Riu de Sella river. Then turn north, using the picturesque dirt road to the precipice. Next, head to Plaries and then go east along Sierra de Albureca, passing Val de Galimera pass and reaching Pego. Then, you head to Moraira via Xalo. You start from Moraira and head south. Passing Calp, then cross Riu Algar river going in the direction of Castell de Guadalest, stopping at Callosa d'En Sarriá and its Motorisation Museum, where you can admire over 140 exhibits, mostly motorcycles. Entrance costs 2 EUR. Then, you go further to Guadalest where you can explore the amazing castle, a few more museums, and see beautiful views. Then, you go down to the retaining dam and head back to Moraira. You start from Moraira and head south straight to Alicante. You start from Moraira and head north. At first, you will be using the main road, but not for long. Near Ondara, you turn west alongside Sierra de la Carrasca mountain range and you will reach d'Alcala. Next, have fun cornering as you go in the direction of Penaquila and further alongside SIerra de Aitana to Terra Mitica region. Next, head north to Nucia and by the sea through Calp to Moraira. Your base will be Hotel Cases the sant Jaume where you start and end your tours. It's between Alicante and Valencia, 30 kilometers from Benidorm, with fast access to the AP7 highway. The region is called Costa Blanca and it has everything that a biker would need: Maditerranean coast, Sierra Aitana mountains, and one of the best roads in Spain. Cap de Sant Antoni is like the norwegian Nord Cap, but here, it has a much warmer weather. The Serranos Gate or Serranos Towers is one of the twelve gates that formed part of the ancient city wall, the Christian Wall (Muralla Cristiana). It was built in Valencian Gothic style at the end of the 14th century (between 1392 and 1398). It is an important landmark and one of the best preserved monuments of Valencia. Of the ancient city wall, which was pulled down in 1865 on the orders of the provincial governor Cirilio Amorós, only the Serranos Towers, the 15th century Cuart Towers, and some other archaeological remains and ruins, such as those of the Jewish Gate (Puerta de los Judíos), have survived. The Torres de Serranos were built in the 14th century, 1392, by Pere Balaguer. It was the main entrance of the city and it was originally build with a defensive function. From 1586 until 1887, the towers were used as a prison for nobles. The Metropolitan Cathedral–Basilica of the Assumption of Our Lady of Valencia, alternatively known as Saint Mary's Cathedral or Valencia Cathedral, is a Roman Catholic parish church. It was consecrated in 1238 by the first bishop of Valencia after the Reconquista, Pere d'Albalat, Archbishop of Tarragona, and was dedicated by order of James I the Conqueror to Saint Mary. It was built over the site of the former Visigothic cathedral, which under the Moors had been turned into a mosque. The Valencian Gothic is the predominant style of this cathedral, although it also contains Romanesque, French Gothic, Renaissance, Baroque, and Neo-Classical elements. One of the supposed Holy Chalices in the world is revered in one of this cathedral's chapels; this chalice has been defended as the true Holy Grail; indeed, most Christian historians all over the world declare that all their evidence points to this Valencian chalice as the most likely candidate for being the authentic cup used at the Last Supper. The Water Tribunal of the plain of Valencia, also known as the Tribunal of Waters is an institution of Justice to settle disputes arising from the use of irrigation water by farmers in several Irrigation Communities and canals (Quart, Benàger i Faitanar, Tormos, Mislata, Mestalla, Favara, Rascanya, Rovella, and Xirivella) in the Horta de València. In 2009, it was chosen along with the Council of Wise Men of the plain of Murcia as intangible cultural heritage by UNESCO. The Llotja de la Seda (English "Silk Exchange") is a late Valencian Gothic style civil building in Valencia, built between 1482 and 1548, and one of the principal tourist attractions in the city. The UNESCO considered it as a World Heritage Site in 1996. Plaza de Toros de Valencia is a bullring in València, Spain. It is currently used for bull fighting. The stadium holds 10,500 people since 2010. It was built in 1841. The City of Arts and Sciences is an entertainment-based cultural and architectural complex in the city of Valencia. It is the most important modern tourist destination in the city of Valencia and one of the most relevant in Spain. The Santa Barbara Castle is located on the top of Benacantil Mountain, 166 metres above sea level; it gives to the city a great strategic value. From there, you can see almost the entire bay of Alicante. On its slopes have been found archaeological remains of the Bronze Age, Iberian, and Roman; but the origin of the fortress is in the late ninth century with the Muslim rule. The Basilica of Santa Maria is the oldest active church in Alicante, Spain. It was built in Valencian Gothic style between the 14th and 16th centuries over the remains of a mosque. The basilica is composed from a single nave with six side chapels located between the buttresses. In 2007, by request of the city of Alicante to the Holy See, the church was promoted to the rank of basilica. The Co-cathedral of Saint Nicholas of Bari is a Roman Catholic co-cathedral located in Alacant, in the Valencian Community of Spain. The church, part of the Diocese of Orihuela-Alicante is dedicated to Saint Nicholas and was elevated to the title of cathedral on 9 March 1959 by Pope John XXIII. A short stroll from Alicante's central esplanade, the Volvo Ocean Race Museum is based in the city's bustling Port Area and offers a fascinating, family-friendly tour through the 41-year history of sailing's most prestigious race around the world. You will have daily buffet breakfasts and three-course dinners. The food will be international cuisine and Mediterranean food. Please book your flight to arrive at Alicante International Airport (ALC) or Valencia Airport (VLC). Transfer from and to the airport is included. Motofiesta will pick you up from the airport with their 9-people car, drive to the nearest beach and welcome you with champagne and strawberries. Then, you'll move to the hotel for a check-in. Airport: Alicante–Elche Airport Airport transfer included: Alicante–Elche Airport No additional charges. You can request this in the next step. Airport: Valencia Airport Airport transfer included: Valencia Airport No additional charges. You can request this in the next step. A reservation requires a deposit of 25% of the total price. The deposit is fully refundable if the booking is cancelled up to 14 days before the arrival date. The rest of the payment should be paid 14 days before arrival. Motofiesta is a Yamaha Motorcycle Test Center based in Spain, but working also in Portugal, Colombia and Poland. This tour can be more/less than 8 days, upon your request. For this organizer you can guarantee your booking through BookMotorcycleTours.com. All major credit cards supported. I would like to receive the BookMotorcycleTours email newsletter, including special Motorcycle Tours offers and giveaways. Show this Motorcycle Tour to your friends.